Belmont held its annual Staff Christmas Breakfast on Wednesday, December 7 and named Bonnie Wagonfield, administrative assistant in the School of Social Sciences, as this year’s Gabhart Award recipient. Named in honor of the late Dr. Herbert C. Gabhart who served Belmont selflessly for 50 years, the Gabhart Award is the highest honor presented to a staff person and honors a member of the Belmont community who demonstrates significant achievements, commitment and service to the University. In her position, Wagonfield supports the daily needs of the faculty and adjuncts within the School of Social Science’s six departments, meets with prospective and current students, assists guests with questions and concerns, supervises student workers and assists the department with event planning and promotion. 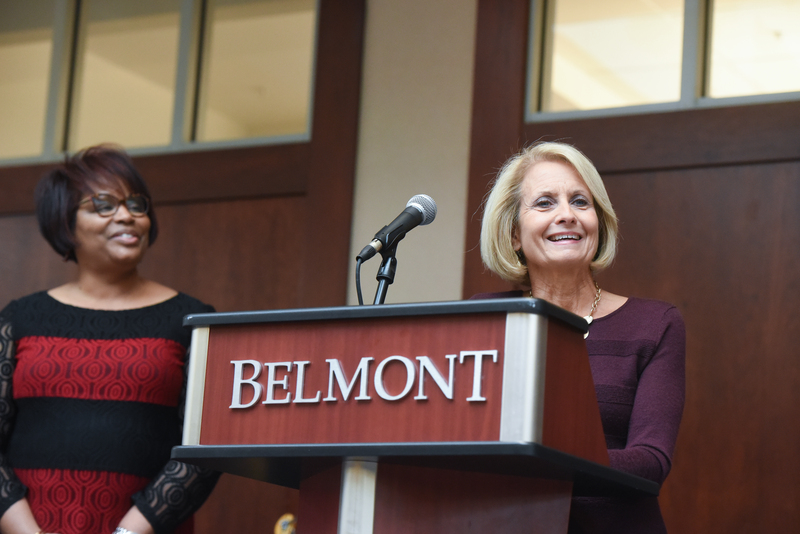 Having been at Belmont for 19 years, Wagonfield said it’s the opportunities to engage with members of her team, both students and faculty, that has been the most meaningful. Wagonfield accepts her award from last year’s award recipient, Gary Hunter. The other finalists for the Gabhart Award this year were Lori LeBleu (Massey College of Business) and Tanya Owen (Custodial Services). Past winners include Don Purdy, Betty Wiseman, Sarah Cates and Gary Hunter.